Gee loves snacking and often gets munchies between meals. Luckily for me she has never been keen on biscuits or chocolate, but it can be difficult finding something that is nutritious, easy and fun apart from fruit. 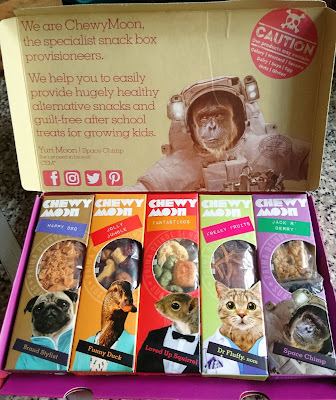 Recently I heard about a new snack box for children called Chewy Moon and Gee was eager and willing to try them out. Chewy Moon is the UK’s first nutritionally balanced subscription snack box designed for children aged 4-10 years but obviously this did not stop Gee from enjoying the snacks. If given to children under this age then supervision would be required whilst they are eating them due to the small pieces. I can honestly say that Gee loved these, especially the Fantasticos. You can find more details over at Chewy Moon. We were sent this item free of charge for the purpose of this review but the opinion is our own.